AP Government Appointment of AP 11th PRC Pay Revision Commission For AP Employees GO 75 : AP New PRC Guidelines and Appointment of Commission as per GO 75 Dt. 28.05.2018. In super session of the orders issued in the G.O. 6th read above, the following orders are issued: The Pay Scales of the State Government employees were revised with effect from 01.07.2013 with monetary benefit from 02.06.2014. The Joint Action Committee of Employees, Teachers, Workers and Pensioners, Andhra Pradesh, Vijayawada; the Andhra Pradesh Non-Gazetted Officers’ Association, Vijayawada; the APJAC of Employees, Teachers, Workers and retired employees Associations (AP JAC Amaravati); the Andhra Pradesh Secretariat Association and other Service Associations have represented for constitution of 11th Pay Revision Commission for the State Government employees. The Government have considered the representations and after careful examination, have decided to constitute the 11th Pay Revision Commission for the State Government employees. Accordingly, Government hereby constitute the 11th Pay Revision Commission. Orders for appointment of Pay Revision Commissioner will be issued in due course. AP Government Appointment of 11th Pay Revision Commission – Orders – Issued. AP GENERAL ADMINISTRATION (SC.A) DEPARTMENT G.O.MS.No.75 Dated: 28-05-2018. 1. From the Chairman, Joint Action Committee of Employees,Teachers, Workers and Pensioners, Andhra Pradesh, Vijayawada Memorandum Dt:27.09.2017. 3. From APJAC of Employees, Teachers, Workers and retired employees Associations (AP JAC Amaravati) representation, Dated:14.09.2017. 5. From the Finance (PC.I) Department e-file bearing No.FIN33024/29/2017-SO (HR IV)-FINANCE, dated:09.05.2018. 6. G.O.Ms.No.72, General Administration (SC.A) Department, Dated:18.05.2018. 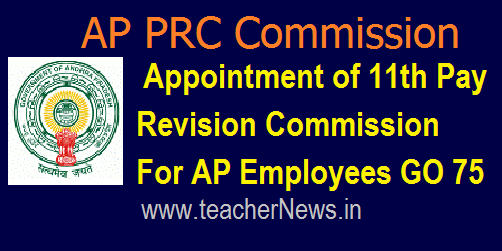 Appointment of AP 11th PRC Pay Revision Commission For AP Employees GO 75. AP Government Pay Revision Commission Appoint Guidelines issued on Dt 28th May 2018.